So far this morning amounts have been 4-12 inches from what I can tell. The heaviest snows have been in the mountains, especially toward Boone when almost a foot has fallen so far. It does appear the dry slot is coming which will put an end to the heavy snow over the next couple of hours. Snow ratios have been 8:1 to 10:1 depending on location. 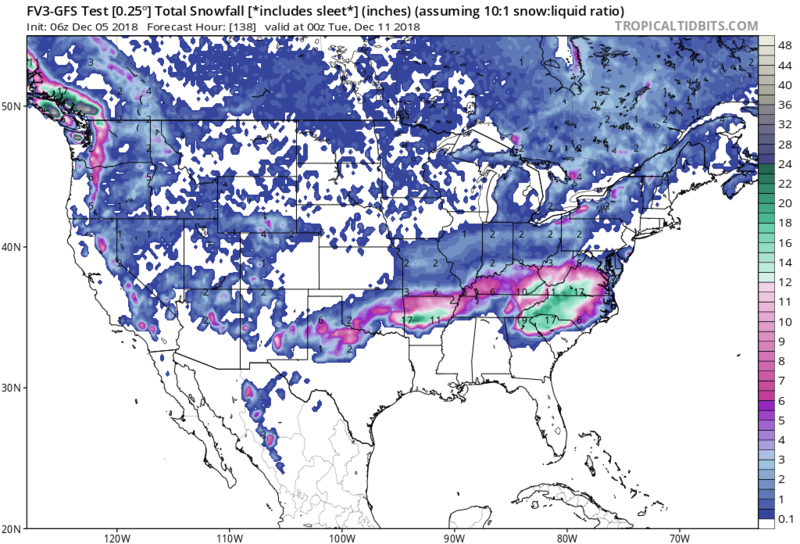 The HRRR model says the heaviest snows are going to switch into western and southwest Virginia and expand over to Richmond and southern Maryland. This is a wet snow that will cause poor travel, power outages and back breaking shoveling. 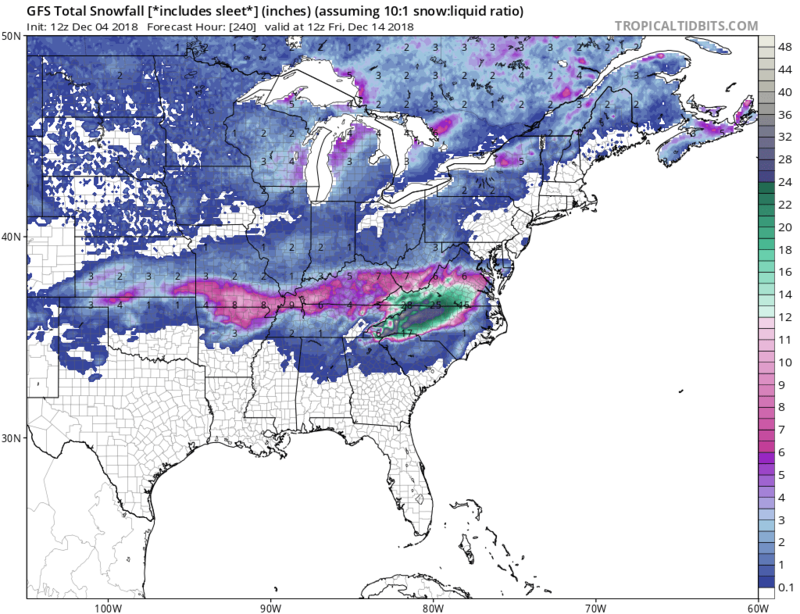 The models trended slightly north of the overall snowfall zone. Most of southwest Virginia into the Roanoke Valley is now back in the heavy snow as well as western and northern North Carolina. 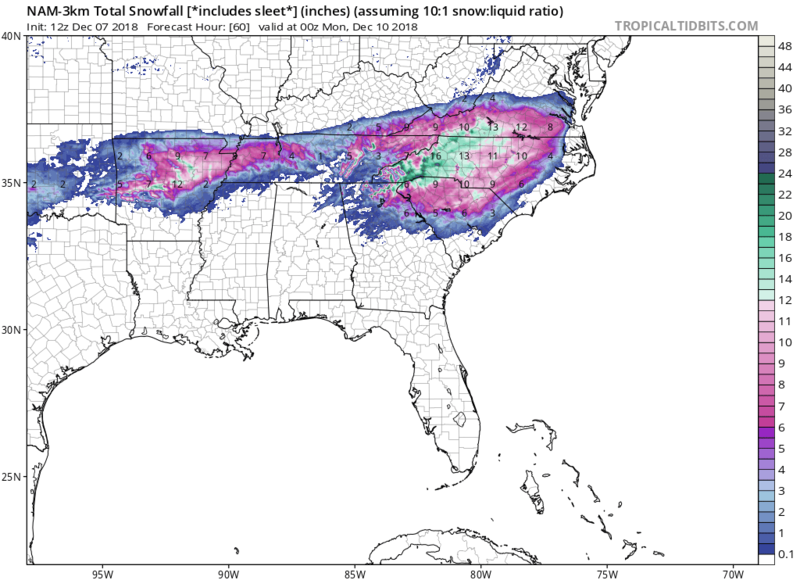 The overall area of snow is pretty much in agreement on the models as shown below. 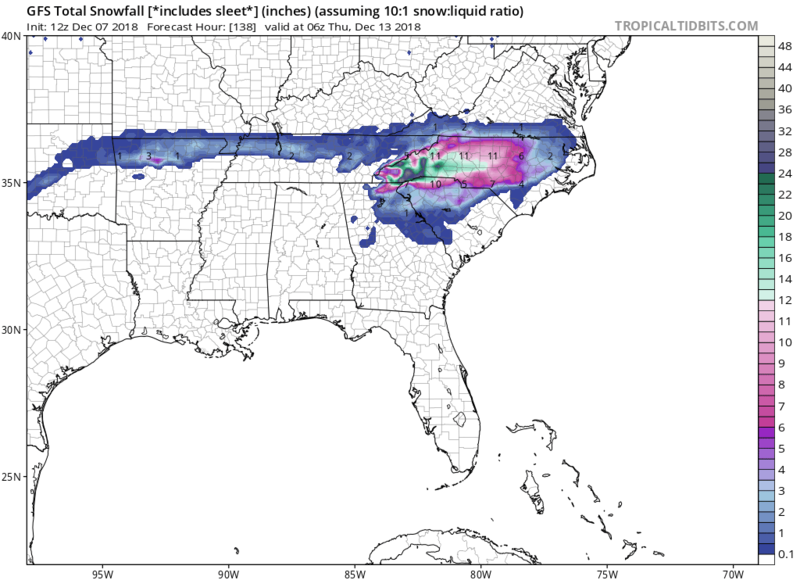 I am going to be using the HRRR model and 3km Nam for snowfall as they will shine light on more detailed snowfall for North Carolina and Virginia. If you have things to do, to them today. My Big Daddy Snow Index will be a 4 for this storm basically for the heavy snow, not much for the wind and drifting. The snow will start as rain but change over to heavy snow tonight and last well into Sunday with rates of 1-3 inches per hour. 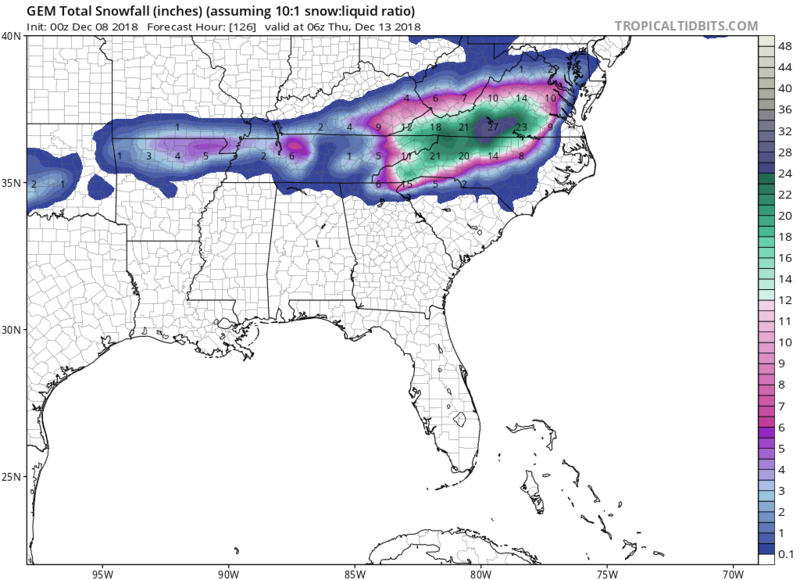 The models shifted south and now it appear they are coming into agreement for a North Caroline dump of snow. 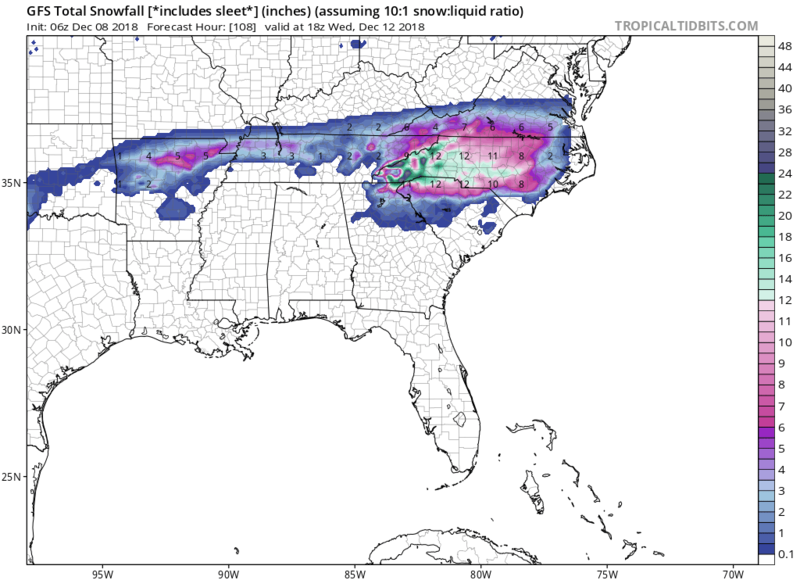 I still think parts of western Virginia up to Roanoke will see snow, perhaps even heavy snow. 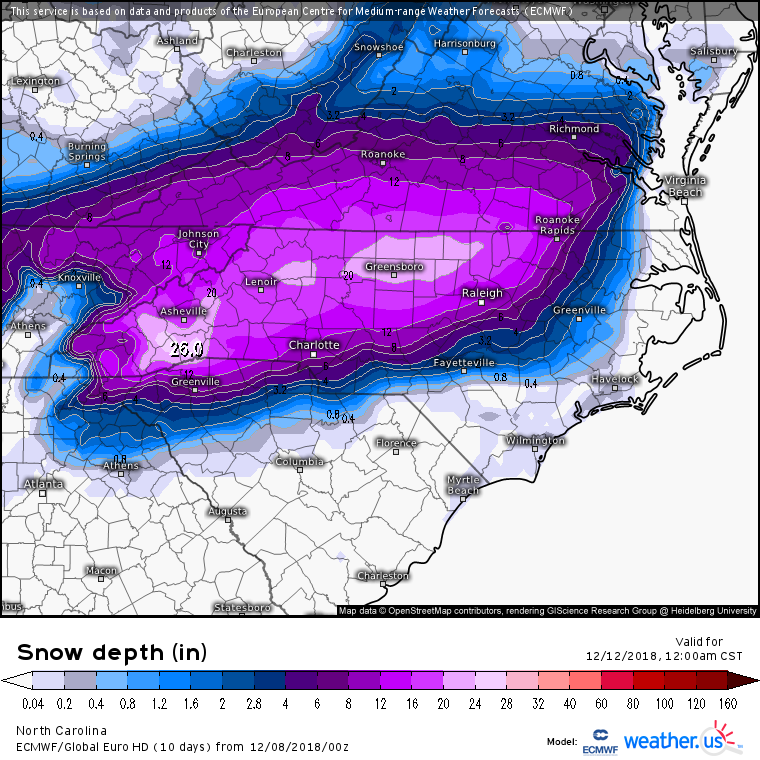 Western North Carolina could be in for a disaster if the amounts of over a foot of snow is correct. 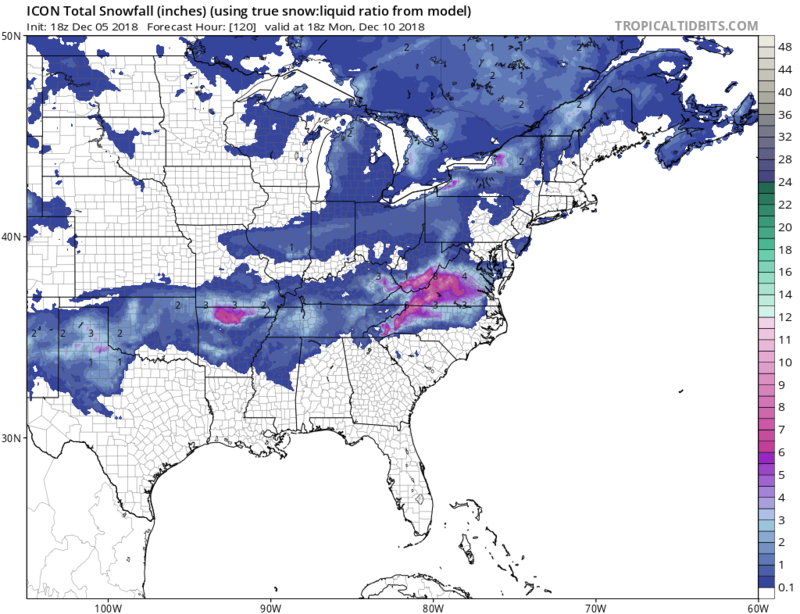 The maps below show 10:1 ratio but my thinking it will be more like 6:1 or 8:1 ratios. Even at that ratio we are talking about tree damage and a very heavy wet snow, perhaps power outages. 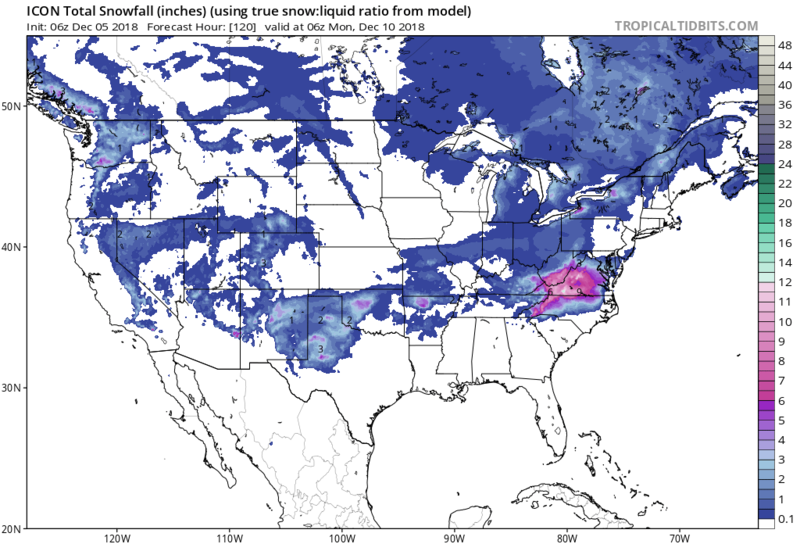 It does appear that the snow is not going to make it too far north so the chances of snow in Baltimore and Washington are waning away with each run of the models. 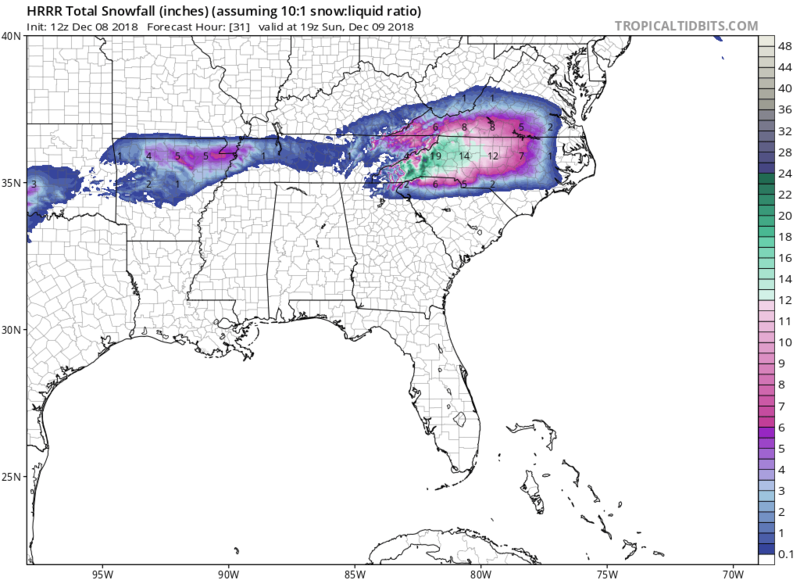 The models continue to make shifts in the placement of the snow across Virginia and North Carolina. 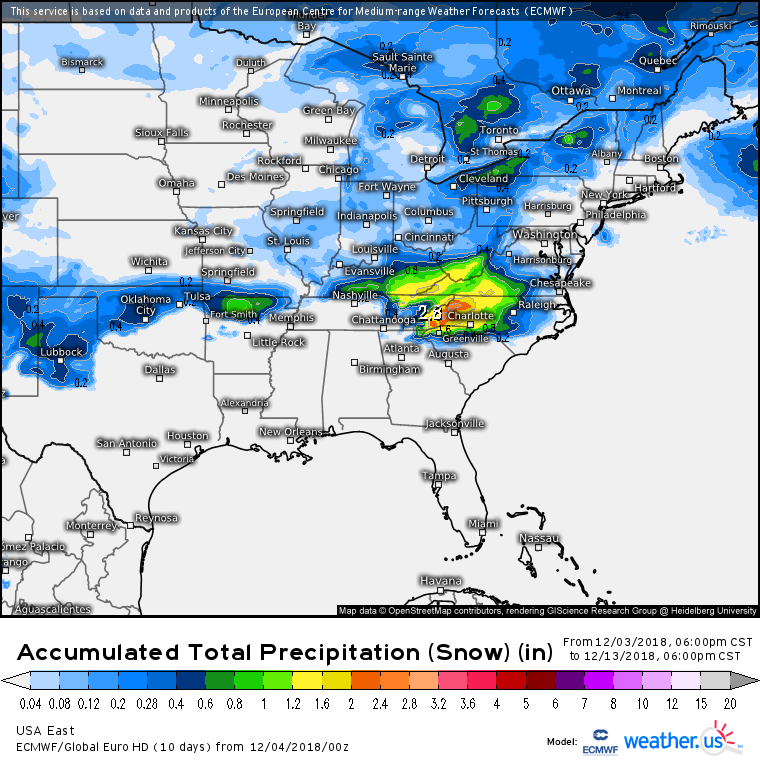 Overnight, the snow shifted south but I am still thinking the bulk of the snow is still in western Virginia as the models will probably shift back north today. You can see on the satellite image below that the storm has come onto the West coast south of San Francisco so with that said still thinking the exit of the storm is south of Virginia beach. I really like the GEM model as my model of choice for the placement of the snowfall. 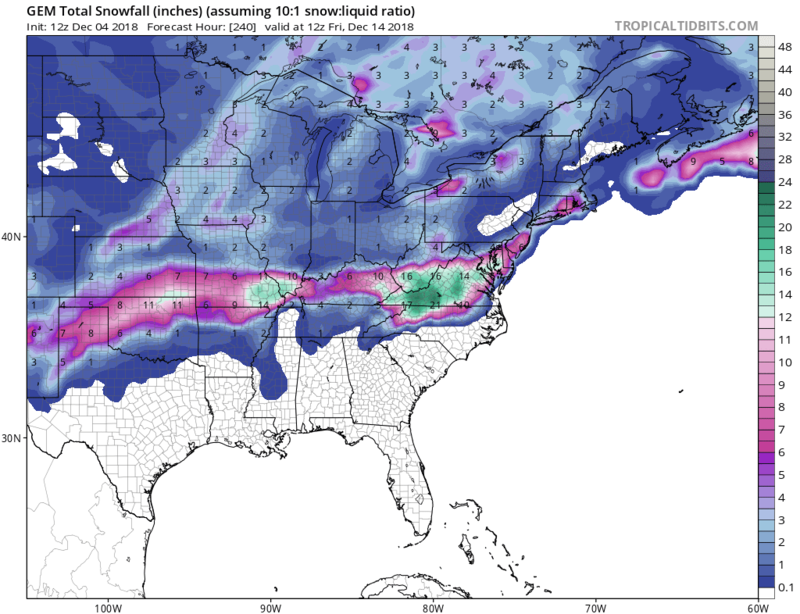 The ICOn model seems be in agreement with the snowfall as well. 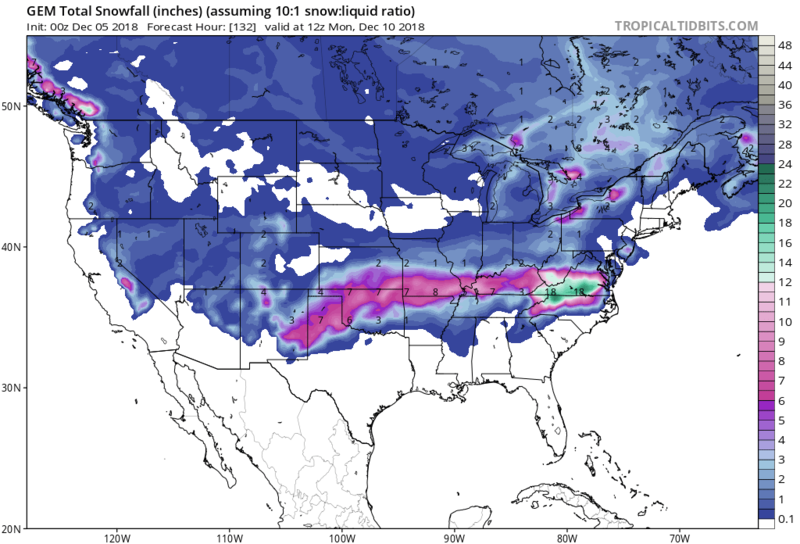 The other models, including the GFS, ECMWF and FV3 are going all over the place with the snow and seem to be inconsistent with the snowfall location. I did notice that the storm appears to be coming south of San Francisco which will put the exit of the storm near Virginia Beach. 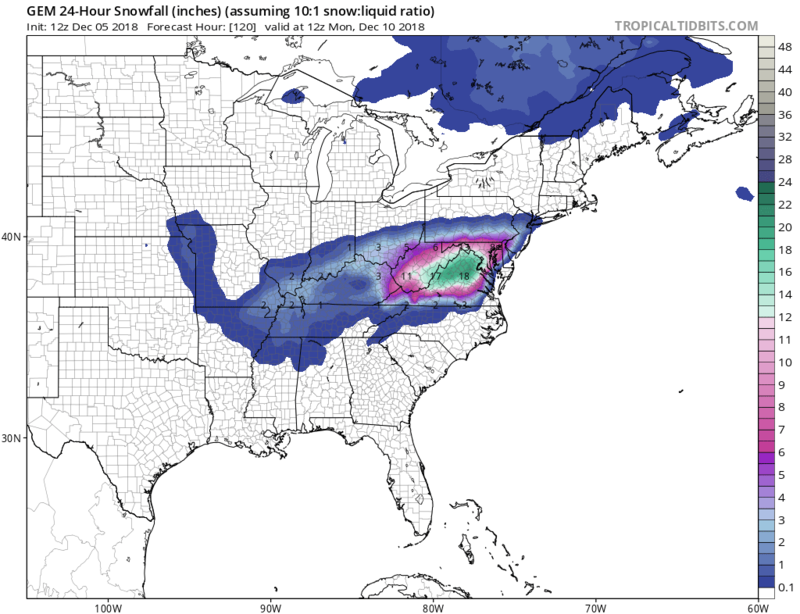 With that said, the snow should hit Virginia and could even impact Baltimore and Washington. Not sure if Philly and New York City get the snow yet but I can see how that happens. North of the PA Turnpike I will be surprised for accumulating snow. 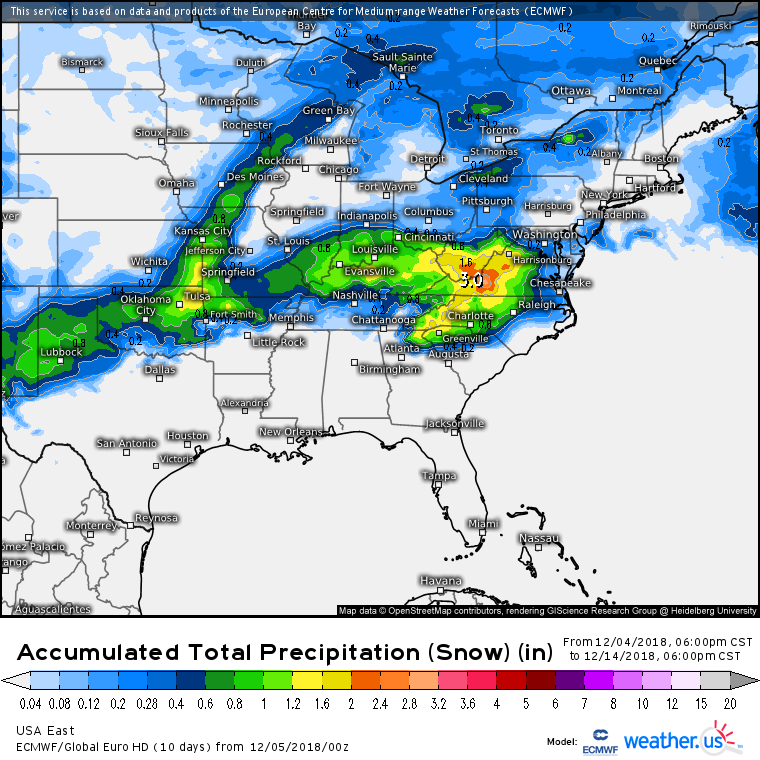 In the Plains, looks like 1-6 inches of snow with some local 8-12 coming across Oklahoma and the Ozarks then thinning out across the southern Ohio Valley before reforming in the cold air damming areas of Virginia. We will probably see 1-4 inches of snow along the Ohio River. 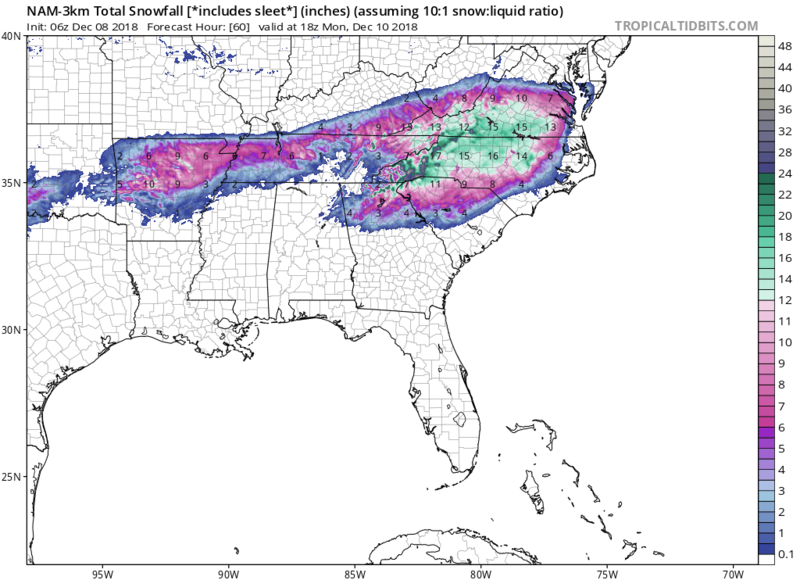 The models seem to be in some agreement this morning on the placement of the snow across western Virginia. 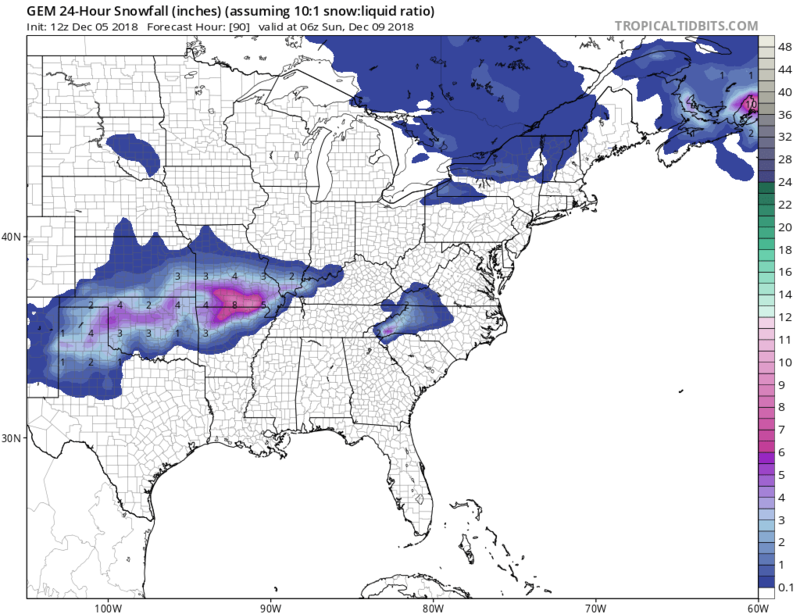 Even the ECMWF model has come north with the snow. 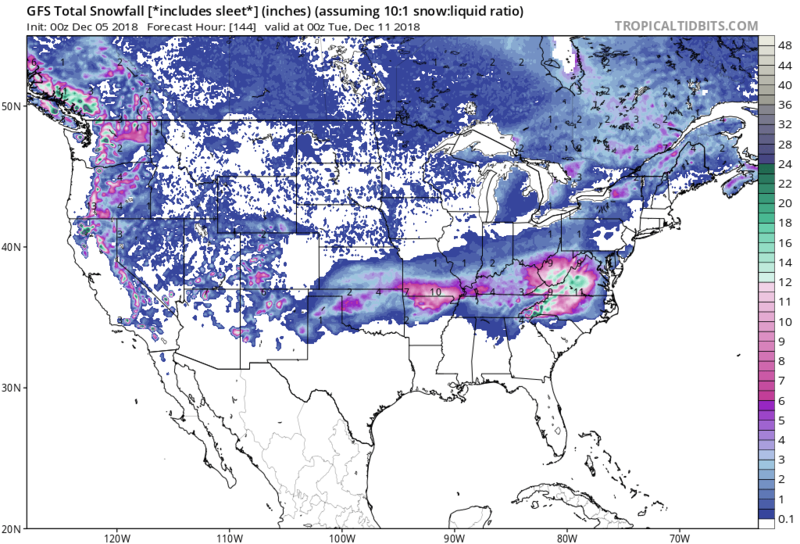 I am still thinking it’s a western Virginia special with amounts up to a foot perhaps more depending on the development of the coastal storm. Navgem model does paint an ugly picture of a deepening storm along the coast which worries me that the energy transfer to the coast could be more snow all the way to the coast of The Dalmarva. Below are the various operational model images for your enjoyment. I am going with winter storm index 3 for this storm. You can hit the link above to see my Madness WinterStorm Index. 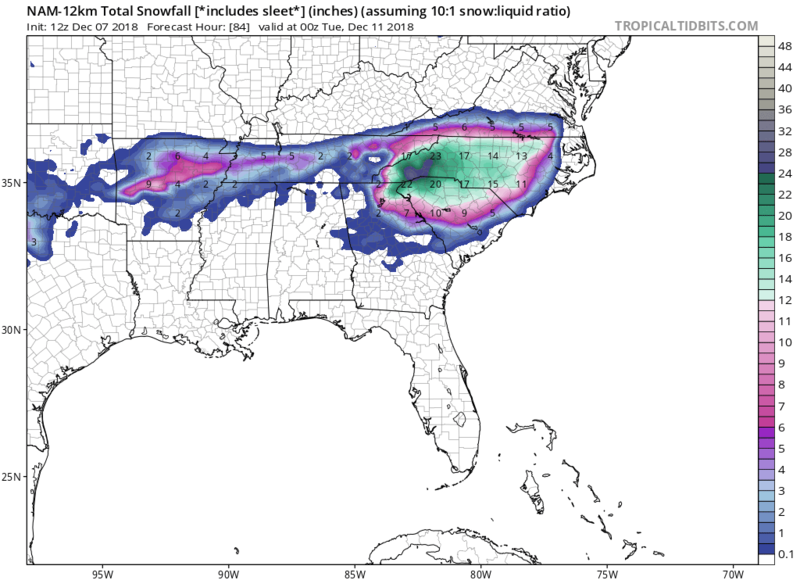 The model continue to hone in on the areas of North Carolina and Virginia for the major snows. 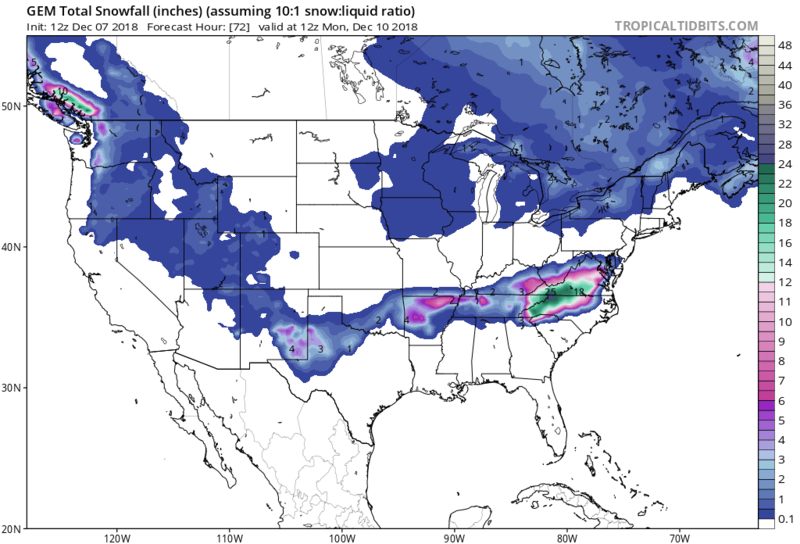 ECMWF model seems to have gone south with the storm while the GFS appears to be adjusting north. 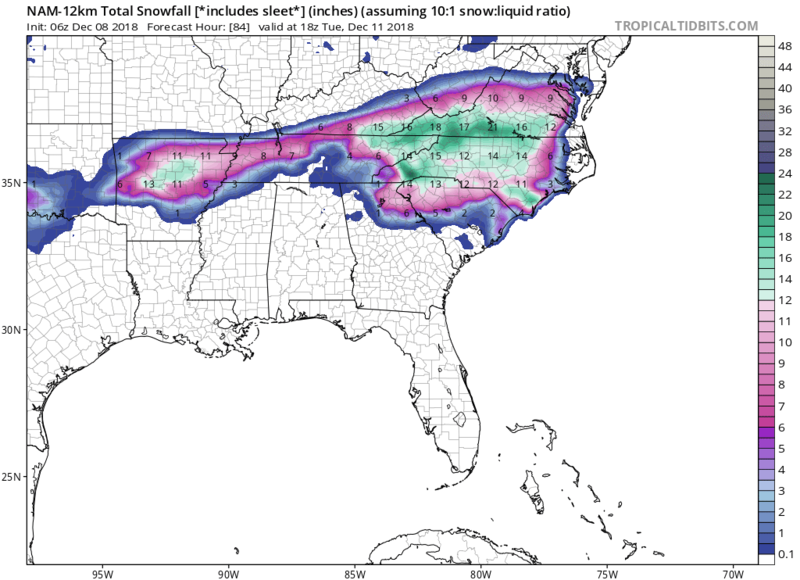 I am leaning toward the GEM model post above as the best solution for the snows. 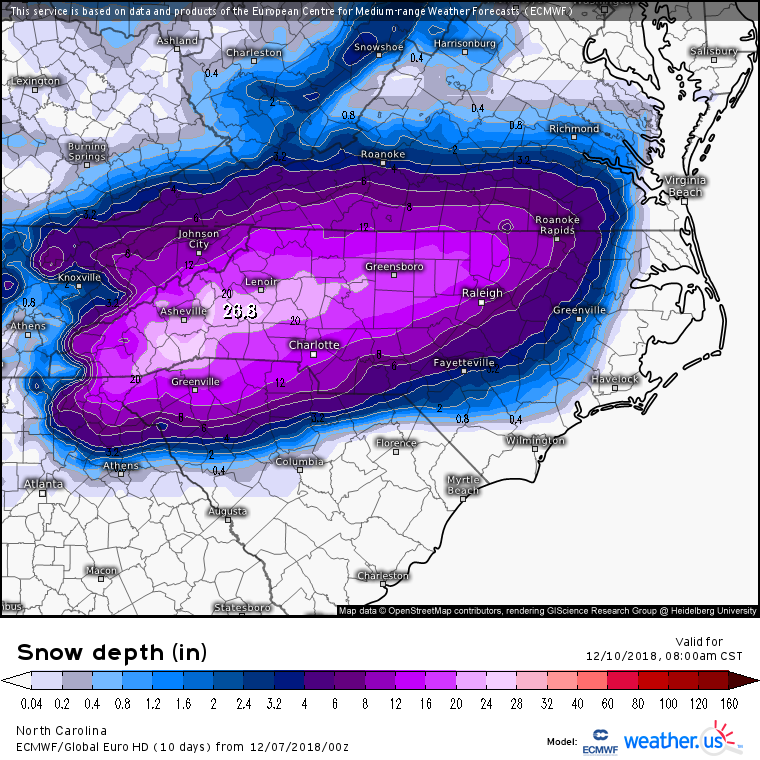 I am thinking that it’s a western Virginia special with amounts nearing a foot or more. 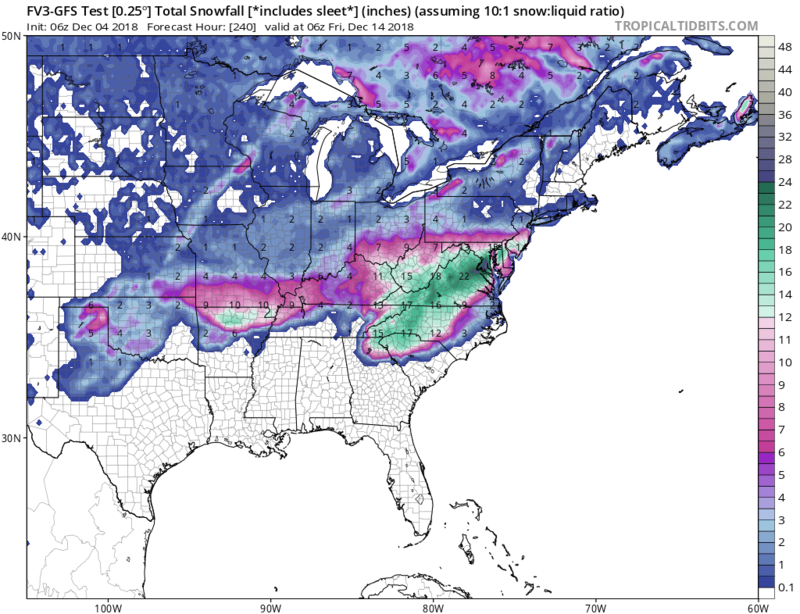 Baltimore and Washington should see snow, but how much I am not sure yet. Typically they get 1-4 inches out of a storm like this. 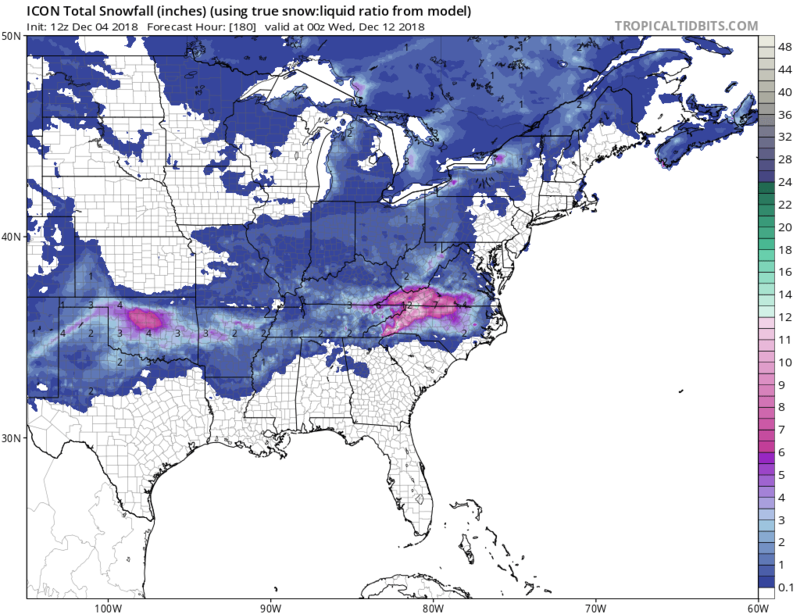 Below are the various snowfall predictions from the models. Looking for the storm to trend back north and exit off the mouth of the Chesapeake Bay… Going with Atmospheric Memory from all the storms exiting off the mid Atlantic coast this past summer.. Time will tell if it’s true!!!! Why does the GEM say Friday 14 December? raise money selling Big Daddy hats!